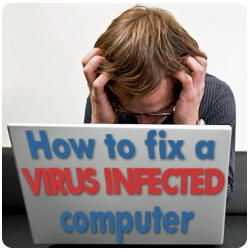 Here are some tips to get your virus-infected PC back to its original, working state. Update your windows security, your router(if you’re using one), make sure your firewall(s) are up to date as well and up. Make sure any anti-virus software you have is up-to-date. It is very important to regularly check for anti-virus update on a regular basis because computer viruses can mutate and become unrecognizable to anti-virus programs overnight, much like human viruses. Use whatever anti-virus you have installed to scan for and remove all existing viruses. This may require rebooting your system into safe mode. There are also many browser-based anti-virus sites that can scan your computer as well and help you take the necessary actions to liberate your machine. More information about some online Anti-virus scan tools can be found here. If worse comes to worst, you can always format your computer. That means you will be deleting everything on your computer. You would have to re-install many programs but it would be worth it to get your computer back to the way she was. This is why it is important to regularly back up all important files stored on your computer. Many people also choose to partition their hard drive to keep Windows system files separated from programs and personal files. Prevention is often more important than treatment. After you have removed all viruses from your computer (or reformatted your system) you should set up some sort of preventative maintenance. This includes using a personal firewall (such as ZoneAlarm or Firewall Plus; Windows 7 and Vista come pre-loaded with a firewall solution), and being very cautious of any and all files that you download from the web. Also, make sure you have a secure WPA password on your router. This can prevent prevent unwanted people like neighbors or people nearby your house from accessing the Internet and gaining unwarranted access to your own personal computer(s). Avoid shady websites that look like they’re phishing for your information or that have excessive pop-ups. Use some discretion on what you put into your computer from the Internet. Your computer is a machine just like your car. You wouldn’t leave your car unlocked with the keys inside in a public parking lot, so why leave your computer unguarded on the web. Take care of your computer by taking these proper measures to prevent viruses in the future. For additional computer maintenance tips and tutorials, be sure to check out our other blog posts.